Elevate your Monopoly game to a whole new level of elegance! Features a recessed faux-leather rolling area and gold foil stamping. Handsome two-tone wooden cabinet with 2 integrated storage drawers. Includes plated die-cast houses and hotels. Fancy schmancy Monopoly! 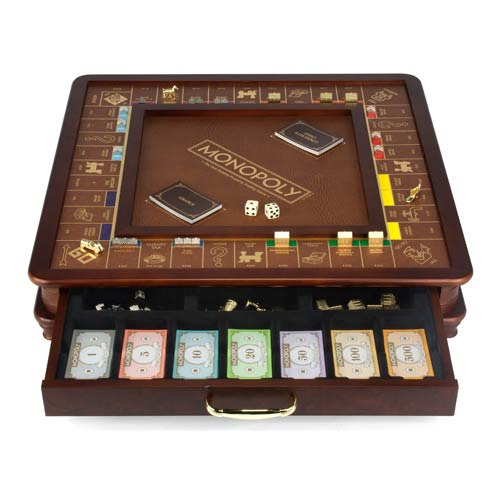 Featuring a handsome two-tone wooden cabinet with burled wood veneers, recessed faux-leather rolling area, and gold foil-stamped game path and rolling area, your Monopoly contests will stand out as the most impressive around. As functional as it is beautiful, the Monopoly Classic Version Luxury Edition Board Game also includes plated die-cast houses and hotels, along with 2 integrated storage drawers. Class up your bouts of Monopoly with this Monopoly Classic Version Luxury Edition Board Game that elevates your game to a whole new level of luxurious elegance! Measures 22-inches long x 22-inches wide x 4-inches tall. Ages 8 and up.